A Pattern for Baby Sweater. Knitting/Crocheting. A pattern for a baby sweater? Do you really have to make it? You don't have to. What you really need to have in order to avoid troubles knitting or crocheting a sweater for a baby is a good sketch with his/her dimensions on it. It will save your time and get you rid of frustration if a beautiful pattern you bought yesterday doesn't fit your baby. That's what we are going to do on this page: to make a sketch for a baby sweater. ANY kind of a sweater for the baby. A few important notes before we begin. A few important notes before we begin. Don't be too scared looking at the sketch below. It is not that complicated even for those who have never had any drawing experience. You will be fine if you follow my directions step-by-step. Your final sketch doesn't have to look perfect. If it slightly reminds my sketch presented on this page and you are able to read the numbers on it, it's Good Enough! The more, on the Knitting Baby Sweater page (check the link at the bottom of this page) I'll show you how to make your final working sketch look as simple as possible. My example sketch is made for a baby whose bust circumference is 60 cm. All calculations are made in cm! You might need a measuring tape which has both cm and inch on it to compare. It is not strictly necessary. 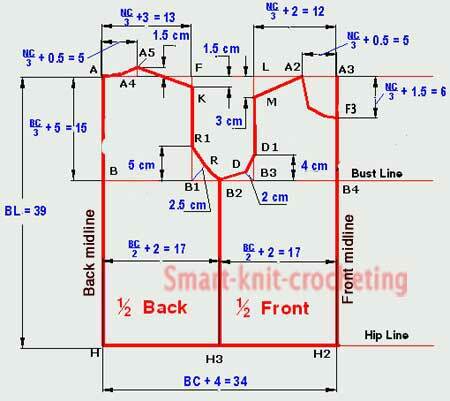 A pattern will work for the knitting or crocheting projects only. Don't use it if you are going to sew something. Lets begin. You will need: a piece of paper, a pencil, a simple calculator, and a measuring tape. 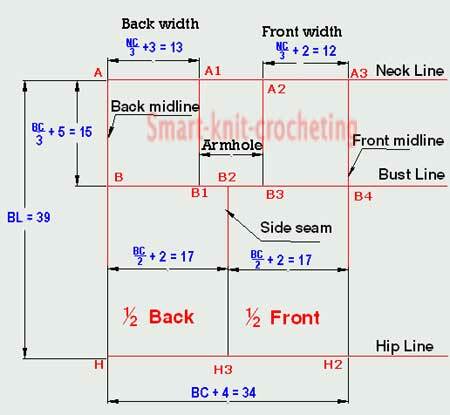 Here is our simple instruction for making a baby sweater. Check measurements below in my example for the reference only. Do your own calculations ! Check how to make measurements at Make a Garment page if necessary. All number which you need to calculate are highlighted in blue on the picture below. 1.Draw a rectangular AA3H2H: AA3 = BC + 4 cm = 34 cm. AH = BL = 39 cm. 2.Draw a horizontal bust line BB4: AB = BC/3 + 5 cm = 15 cm (rounded). Distance AA4 = NC/3 + 0.5 cm = 5 cm (rounded). Distance A4A5 = constant = 1.5 cm for all sizes. Connect points A and A5 with a smooth curve. Distance B1R1 = constant = 5 cm for all sizes. 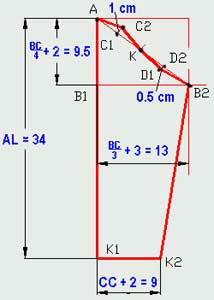 Distance B1R = constant = 2.5 cm for all sizes and bisects angle R1B1B2. Connect points R1, R and B2 with a smooth curve. Distance FK = constant = 1.5 cm for all sizes. Connect points A5 and K with a straight line. Distance A3F = NC/3 + 1.5 cm = 6 cm. Distance A2A3 = NC/3 + 0.5 cm = 5 cm. Connect points A2 and F3 with a smooth curve. Distance D1B3 = constant = 4 cm for all sizes. Distance DB3 = constant = 2.0 cm for all sizes and bisects angle D1B3B2. Connect points D1, D and B2 with a smooth curve. Distance LM = constant = 3 cm for all sizes. Connect points A2 and M with a straight line. Vertical distance AK1 = AL = 34 cm. Horizontal distance K1K2 = CC + 2cm = 9 cm. Distance B1B2 = AL = 34 cm. Horizontal line B1B2: BC/3 + 3 cm = 13 cm. Connect points A, K1, K2 ,and B2 with the straight lines. Line KB2: Find midpoint D2 . KD2 = D2B2.From point D2 to point D1 draw a perpendicular line D2D1 = const= 0.5 cm. From point C1 to point C2 draw a perpendicular line C1C2 = const= 1 cm. Connect points A, C2, K, D1, and B2 with a smooth curve.